The Raving Queen: Darlings, The Hottest Ticket In Town Tonight Is Not Even In A Theater!!!!!!!!!!!!!! Darlings, The Hottest Ticket In Town Tonight Is Not Even In A Theater!!!!!!!!!!!!!! 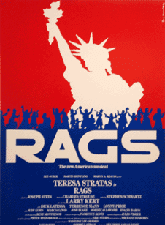 This is the evening, girls, for the clandestine reading of "RAGS," taking place at somewhere undisclosed, amidst the Roundabout domicile, attended by an undisclosed few, with only the sure thing being that, headlining in the role of Rebecca, will be our own Jessie Mueller!!!!!!!! Who could ask for anything more????????? Well, I have asked, could ask, and will ask again, to be there this evening to cheer on this acknowledgement of a genuine musical masterpiece, done recently by the Beautiful Soup Theater Collective, and sure to be nailed, as no Rebecca has since the days of Teresa Stratas, by Jessie!!!!!!!! I am telling you, I am getting goose bumps, just thinking about it!!!!!!!!!!!!!!! This, I am telling you, is tonight's best kept theatrical secret event. What can I say, except to cheer Jessie on, know she will do a splendid job, and yearn for the next time an opportunity presents itself to see her perform!??????????????????? Have you seen the YouTube, darlings, of Jessie performing "Being Alive," at someone's wedding?????????? Think what she could do, at mine!!!!!!!!!!!!!!!!!!!!! Bet she's be easier to get than Sylvia Weinstock!!!!!!!!!!! But you know me, girls, I want them BOTH!!!!!!!!!!!!!!!!!!!!!! Break a leg, Jessie! The ears of my girls and I will be telepathically attuned!!!!!!!!!!!!!!!!!!!!!!! !